He slept for most of the plane trip home, but when he woke up, Josh Manson had plenty to smile about. When the final horn sounded in Game 4 of Anaheim’s Western Conference quarterfinal series against rival Calgary, the Ducks had punched their ticket to the next round. And while it was a jubilant atmosphere in the visitors’ dressing room at the Saddledome minutes after the series-clinching 3-1 victory, it was a more muted scene the following day. It was made even sweeter for Manson, who had his own cheering section for all four wins. It was also ideal in terms of having an extended break from the playoff grind. Rest was the name of the game for Manson and his teammates, who are now facing off against Edmonton in the Western semifinals. The 25-year-old defenceman took advantage of the break to catch up on his favourite TV show, took in some hockey, and enjoyed a little California dreaming. 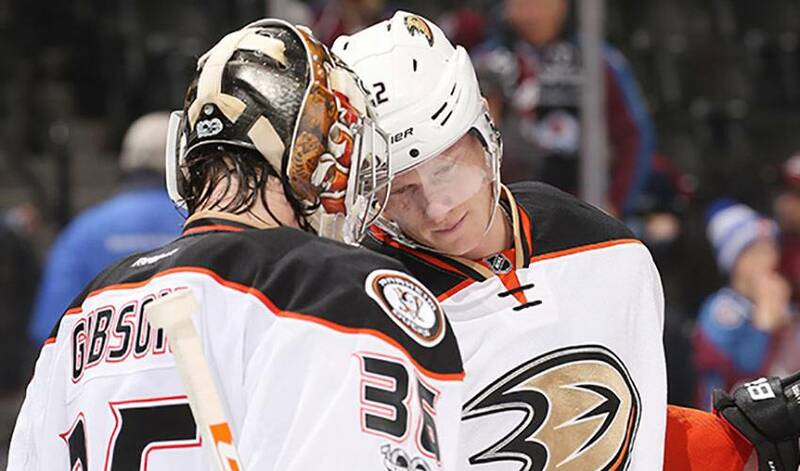 “I watch hockey,” said the Illinois-born Manson, selected 160th overall by the Ducks in 2011. “I’m a fan of hockey. I watch just to see how things are going. Other than that, you just do the things you normally do. You get some rest and let your body have a bit of a break. Obviously, the playoffs are a long journey. You just try to relax, watch a little bit of hockey and enjoy the California lifestyle. Typically, Manson will have company no matter what he’s doing. Manson, who played 21:28 Anaheim’s 5-3 loss to Edmonton in Game 1, hopes there are better days ahead for the tight-knit group.